The start location is Campolindo High School, 300 Moraga Rd, Moraga. From Highway 24 eastbound take the Central Lafayette/Oak Hill exit and go right on Oak Hill, left on Mt Diablo Blvd and right on Moraga Rd. From Highway 24 westbound take the Central Lafayette exit and go right on Deer Hill Rd, right on First St, right on Mt Diablo Blvd and left on Moraga Rd. Each of the above turns is at the first opportunity. Continue South on Moraga Rd for about 2.3 miles. Turn Right on Campolindo Drive where attendants will direct you to the available parking. Parking spaces at Campolindo High School's parking lot are limited. Please carpool if at all possible. We offer a carpool matching application to help you organize carpools. For your convenience we also offer a car-free check-in station at the Island Picnic Area rest stop in Tilden Park. This is the first rest stop, about 13+ miles from Campolindo High School. It works best for local residents who are already familiar with the popular cycling roads in the area. It is only for riders who bike there and have pre-registered for a Tilden Park start. Check-in at Island/Tilden begins at 7:30 am, which is also when the rest stop opens. Island rest stop closes at 10:30 am. Island rest stop has absolutely no parking for riders' cars. All parking spaces in the area will be taken by our bike racks, support vehicles, and century workers' vehicles. The route sheet that you receive when you check in at Island will be the same as given out at Campolindo High School, so remember you are starting from the first rest stop and adjust the printed mileage accordingly. It is possible to BART to the Grizzly Peak Century if you use the alternative car-free start. Remember BART will be on Sunday schedule, so stations don't open very early. The first train to North Berkeley BART station (from the South) arrives at about 8:25 am. If you ride up Virginia Street and Spruce Street you will probably get to Island by about 9:15 am. 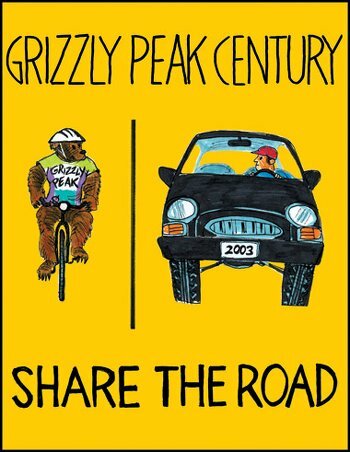 Unless you're particularly slow, the Metric Century is certainly possible. Note that the first train to Orinda BART (from the West) arrives at about 8:25 am, so it is impossible to use BART to get to the regular start at Campolindo. It is just too late.